If you like your music hard, fast and loud, then Artpark was the place to be on Tuesday. 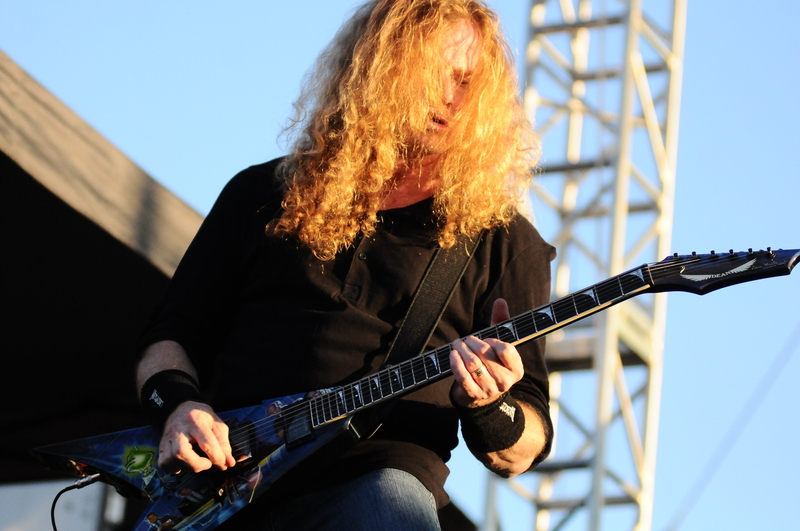 Megadeth unleashed an assault that the beautiful outdoor stage of Artpark had never seen before. Playing one of just a handful North American dates this summer, they opened with one of their most well known songs with “Hangar 18” as they came out blistering as they tore on to the stage. The stage set up was relatively simple but accommodating to leader Dave Mustaine as he and the rest of Megadeth, bassist David Ellefson, drummer Shawn Drover and guitarist Chris Broderick played a fast, loud set featuring such songs as “Public Enemy No. 1”, “Sweating Bullets”, “She-Wolf”, “Symphony Of Destruction”, “Peace Sells” and many more. Aside from crowd interaction, amazing stage presence and deity level guitar playing coupled with pounding baseline and backing drum kit, the crowd loved the ensemble. It took them some time to work up to mosh pits, but once they decided it was happening, there was no stopping them. The energy in the performance seemed to charge the crowd until it was out of control. Despite a smaller crowd than normal at the venue, Megadeth fans received their money’s worth and then some. With Artpark not being big on metal shows it certainly got its first taste of old school thrash. Boy did it ever. Diamond Plate, a band based out of Chicago, opened and it must be because of their technical supremacy as to the reason why. With a stripped stage, the three piece musically was technically sound, and you usually don’t expect anything from the opener. They came out and with only one guitarist played with all the skill of a five piece band in a thrash rebirth style reminiscent of the 80s. It sounded like a Metallica meets Slayer influence with lead vocals playing bass. Tremendous sound resonating with only three members. Both bands playing fast as well as sophisticated, Artpark could not have had a better metal combo to add to their summer series.